Welcome to the High Strangeness Bookclub! 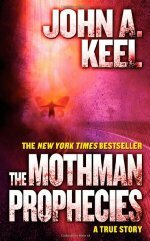 For our first book, we're discussing John Keel's classic The Mothman Prophecies. First off, this book is not really like the 2002 Richard Gere movie it inspired. The movie plots a straight line towards the collapse of the Silver Bridge in 1967. Instead, The Mothman Prophecies book is almost a collection of anecdotes centered around Keel's investigation of strange sightings in Point Pleasant, West Virginia. Mysterious phone calls, bizarre visitors, and lights in the sky abound, but easy to follow narratives do not. Keel is the author who popularized the idea of the Men in Black, those somberly dressed interviewers who would show up in the wake of UFO sightings (or, if Sony would have us believe, a 21 Jump Street crossover). Keel's theories as to what is going on in regards to flying saucers, cryptids, faerie folks, and the Men in Black are better expressed in some of his other works (Operation: Trojan Horse, for example) but The Mothman Prophecies stands head and shoulders above the rest when it comes to capturing the sense of being there and experiencing the strangeness that comes along these topics. A Friendly Reminder that we're leaning 'kayfabe' for this group. Straight up debunking is no fun - even though Mothman Hunting is SERIOUS BUSINESS. I haven't read this book, although the post is making me want to pick it up, which I might do. I'll be back with thoughts if that happens. BUT for Mothman enthusiasts, I cannot recommend the Mothman Museum highly enough. There's very little in the way artifacts, beyond props from the movie, but the place is clearly run by a true believer; it's a total delight. I'm a few chapters in. Keel, a little melodramatically, sets a strong scene in the opening, but then...yeah. You expect a narrative to emerge. It doesn't. At least not as far as I've read. I'm enjoying it, but there isn't a lot of forward motion. Yeah, most of the fringe authors don't understand stuff like narratives so even when the book is "about" an event, things tend to jump around a lot. My favorite parts are the people who are not good at being humans, like they don't know how to cut their own food or how to dress themselves. This is a recurring theme in the fringe. I've just started (four or five chapters in? ), but I'm really enjoying those parts. Enough that I admitted to my wife I was reading this so I could relate the stories to her. Opening with anecdote about the person believing him to be a mysterious figure is a surprisingly deft move, since it sets up the whole framework of, I guess, dubious or questioning belief that characterizes what I've read. Belief that people saw something don't necessarily believe it's what they think it is. In general, there's some weirdness relating to when it was written,* but I'm liking it. The breadth means that it's not really zeroed in Mothman yet, but I'm finding the litany of bird men and flying saucer appearances entertaining and I'm enjoying getting glimpses of Keel's vision for how it's all connected. I do hope we get more Mothman soon. When he gets too much into talking about things being manifestations of energy or whatever, it's not as good. Like the monster in a horror movie, the grand theory is better when it's not seen fully. I also think it's interesting to read this in 2016 and remember what a legitimately big deal UFOs were for a while. I grew up in the 80s reading a ton of these sorts of books, watching In Search Of... etc., but it's just not a part of the culture anymore. *Comments about women's appearance, the repeated use of "oriental"
Yeah, the Oriental stuff is weirdly dated. Although, it is notable that Keel's Men in Black have olive or reddish complexions, not the pale white that seems more common in popular culture now. Whether this is a good or bad note, I don't know. I got about a quarter of the way through the book and it is all just disjointed sightings and very little narrative at all. Is there any reason to continue through, or is that pretty much the whole of it? Also, is it a conspiracy that there seems to be no actual high strangeness club? I want to follow along with any more posts that might be coming.